I haven’t been participating in the Baking with Julia cookbook bake along for quite a while, but when I saw rye bread as the next assignment I had to jump back in. 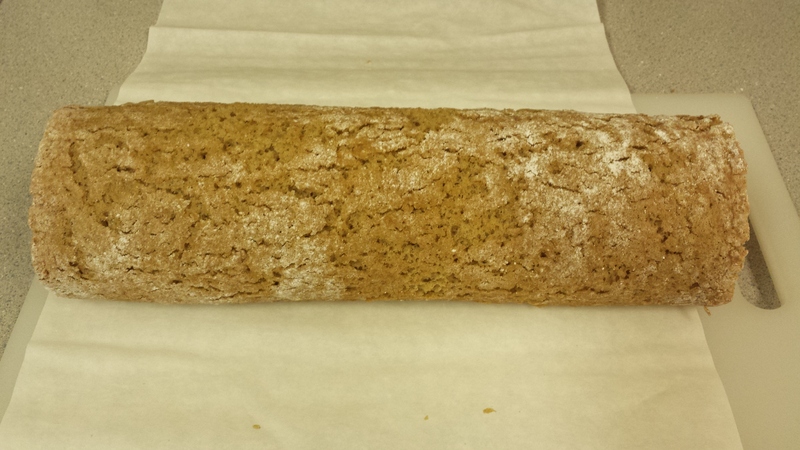 I like to make bread and I really like rye bread. This bread turned out great! What is different about this recipe from other rye breads that I’ve tried, is finely grinding two tablespoons of caraway seeds in a coffee grinder to add to the dough along with the whole caraway seeds. The resulting flavor boost is wonderful. It makes great sandwiches! I didn’t read ahead carefully and had the dough nicely risen and ready to shape when I saw that you were supposed to put the shaped loaves in a towel and suspend the towels from your kitchen cabinets for 30 minutes. Really? I skipped that part and just shaped the loaves and let them rise on a parchment lined baking sheet. When they had risen sufficiently I slashed the tops and slipped them into the oven. Viola, beautiful loaves! I’ll be making this bread again, but my loaves will just have to rise on parchment covered baking sheets. No hanging from the kitchen cabinets for me! This post participates in the Baking with Julia bake along. The recipe can be found on pages 98-100 of the book or at Karen’s Kitchen Stories. 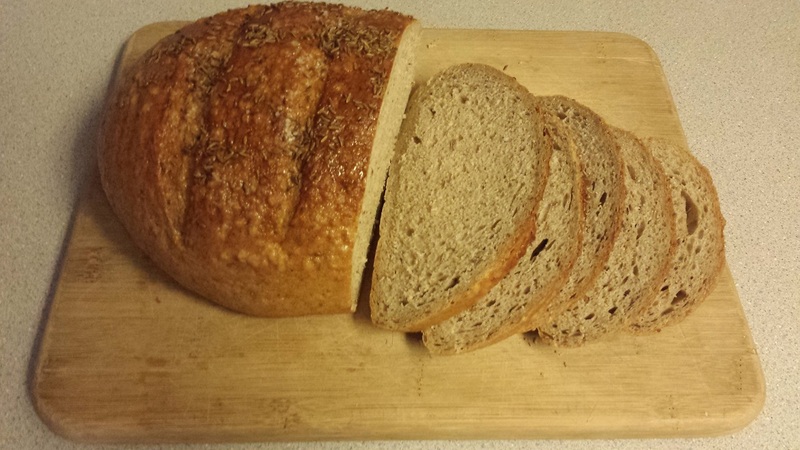 Head on over to the Tuesdays with Dorie LYL post to see what the other bakers did with their loaves. 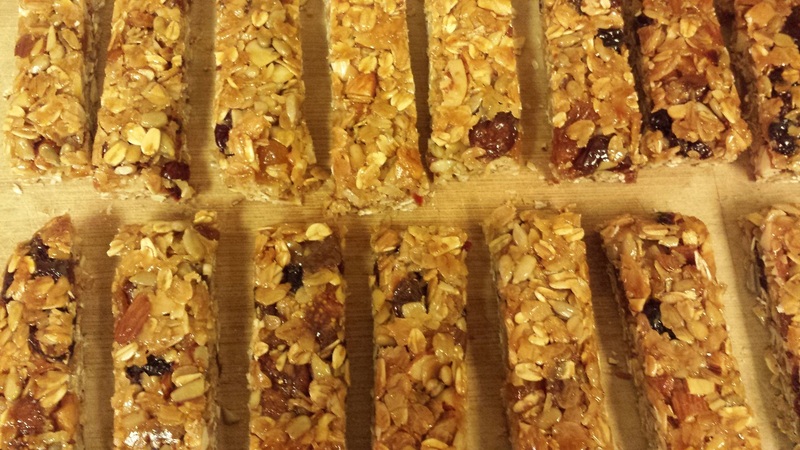 These bars were really easy to make and really good. There were no tricky techniques involved in this recipe. 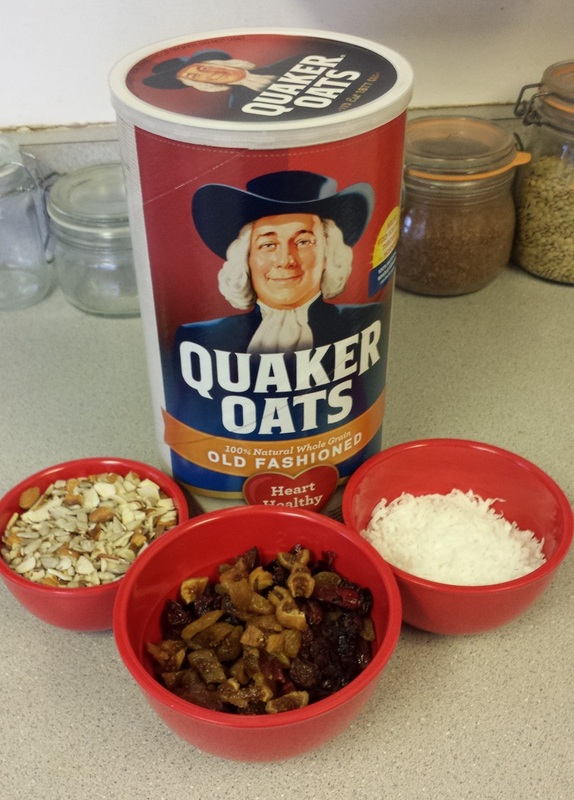 I did have to go to the local health food store to find the brown rice syrup, but otherwise I actually had most of the other ingredients on hand. I didn’t have pumpkin seeds and forgot to get them when I was at the health food store, so I just used a bit more of the almonds and the sunflower seeds. For the dried fruit I used a mix of white and dark raisins, dried cranberries, dried figs, and a couple of dried apple slices that I wanted to use up. I had thought about leaving the coconut out, but I’m glad I didn’t. It does add nice flavor to the bars. I didn’t really have any problems with this recipe, however, when I went to remove them from the pan they were very sticky on the bottom. 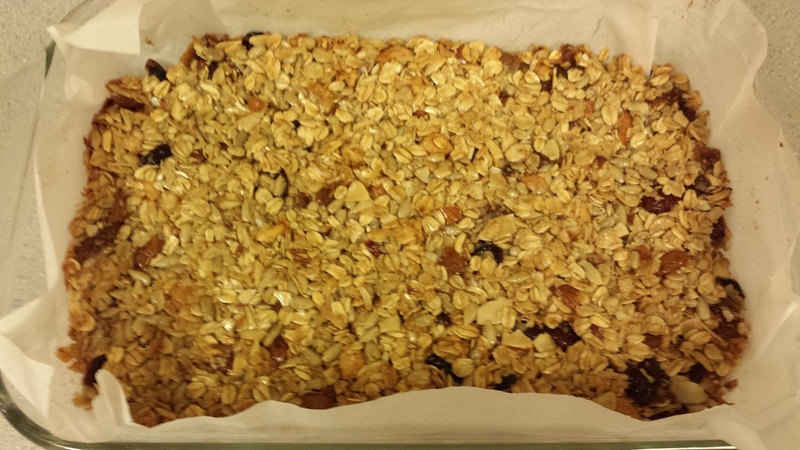 You really do need to line the pan with parchment paper like the recipe says. I don’t think you could get them out in one piece if you didn’t use the parchment paper. There were too many for my husband and I to consume in just a few days, so I wrapped some of them in parchment paper and put them in the freezer. I took one out in a couple of days just to see how it had survived the freezer and was pleased with the results. So even though Dorie doesn’t mention freezing them, I’d say it’s ok if you can’t use them all right away. They make a great mid afternoon snack or a quick morning breakfast substitute. 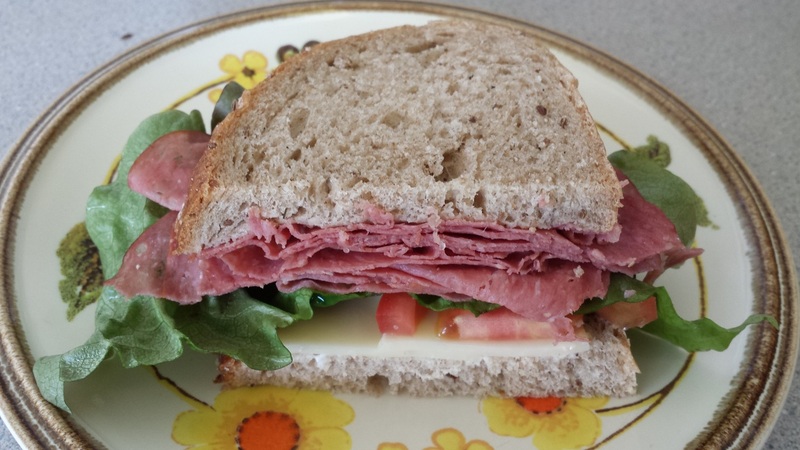 When I started this blog in January of 2012 it was for the purpose of participating in Tuesdays With Dorie “Baking with Julia” cookbook bake-along. Two recipes a month were assigned from the book and the idea was all the participants would bake the same recipe and we would post our results on the first and third Tuesday of the month. Well I made it through 2012 and into April of 2013, making most of the assignments and posting my results. Then I bogged down, or maybe I should say blogged down. I chose the title for my blog “createdbycarlene”, thinking that I might occasionally post about some of my other creations such as knitting, crochet, or photography. This year I am going to try to add a few of those posts. When I read through this recipe I wondered if I could actually pull this off as a success. I decided that I didn’t want to have the pressure of making it for a special event, so I just made it on a day off and took it to work the next day. As it turned out, I had a success! I did begin with a fail—the nuts. 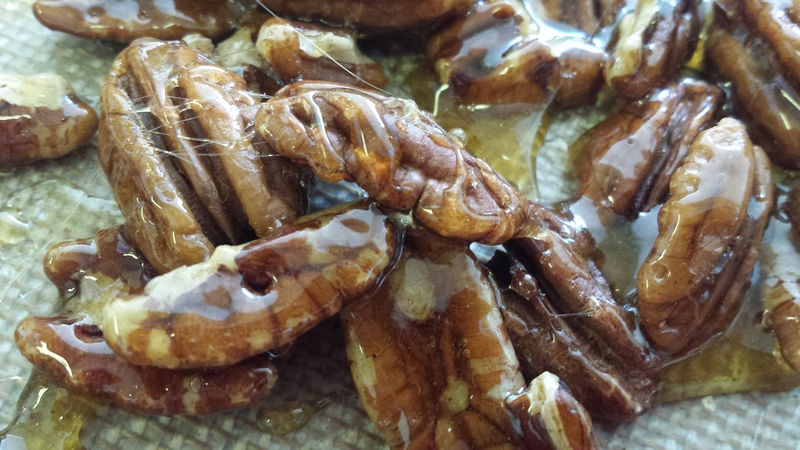 I swirled and played with the sugar too much and the syrup was evaporating and it hadn’t turned amber. I panicked and put the nuts in and ended up with a soft white opaque covering on the nuts instead of beautiful shiny amber coating. I decided to do them over and had success the second time around. This time I just swirled the syrup to moisten the sugar, and then left it alone. I watched it carefully as it turned to a beautiful amber color. 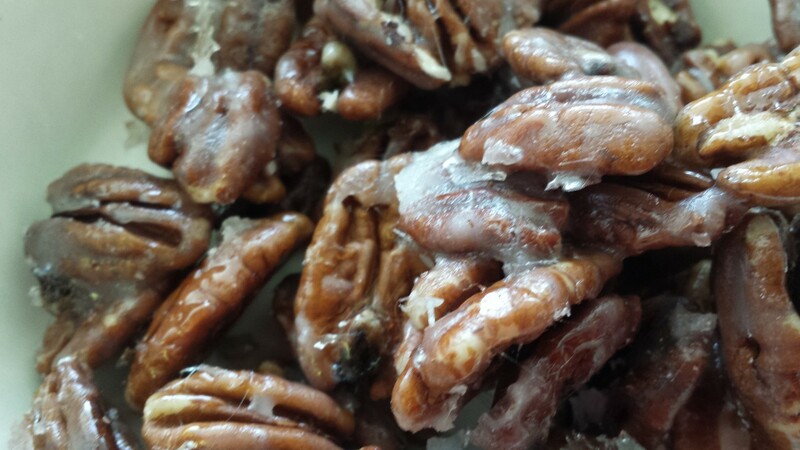 We ate the failed sugar coated nuts and they tasted great even though they weren’t pretty. Next step make the cake. Whisking the eggs and brown sugar over simmering water instilled a bit of panic, however, it worked and I didn’t end up with sweet scrambled eggs. I did have a crack in the cake after I rolled it, but as Dorie says, filling and frosting patch it up nicely. Preparing the frosting was another tricky procedure; pouring 242 degree syrup into the mixer while it is running at medium speed beating the egg whites, but I actually did it without mishap. 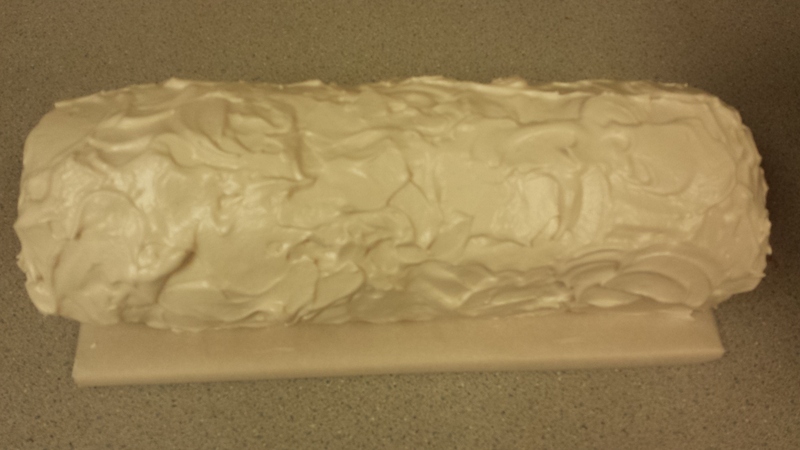 My frosting turned into the beautiful shiny marshmallow look that was in the photo in the book. All of this only took an afternoon to accomplish. I had thought it would take much longer. I took it to work and it was eaten within an hour of the announcement that there was cake in the staff lounge. I really enjoyed making this and would not hesitate to do it again. 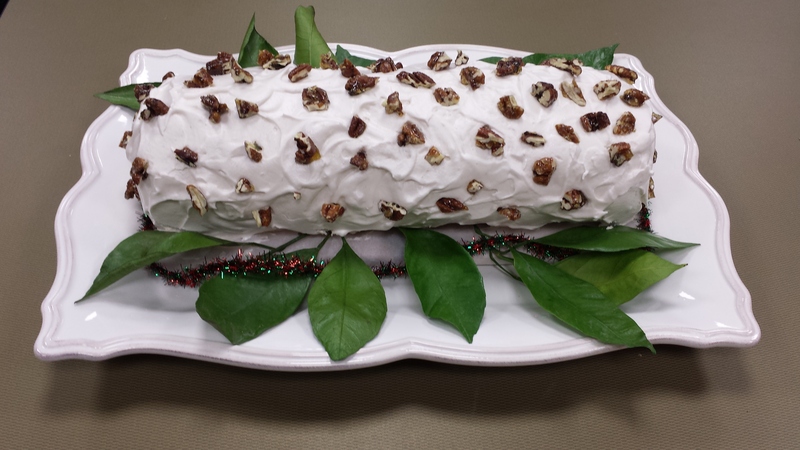 This was our Christmas assignment from Dorie Greenspan’s Baking Chez Moi, baking group. We do not post the recipes, if you want to try this recipe you will need to purchase the book. 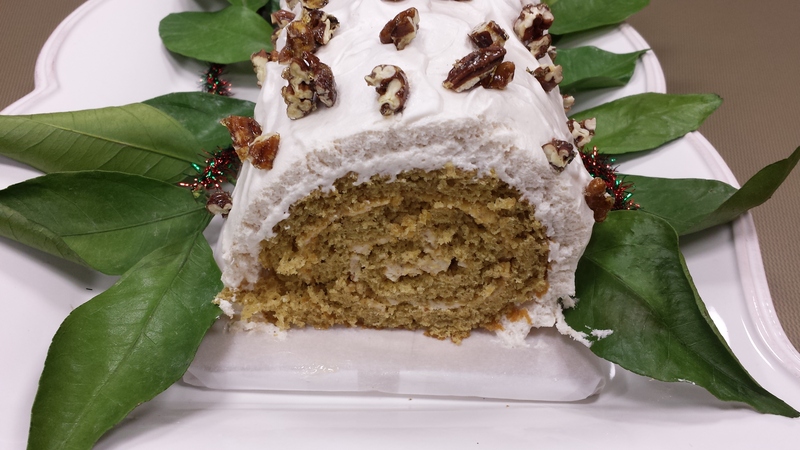 To see how others in the group fared with this recipe you can check the blog, Tuesday’s with Dorie. This is my second try at Rugelach. It was a bit easier this time. I’m not saying it’s easy, just that it goes a bit smoother the second time around. There are multiple steps involved in making rugelach. I think it actually works in quite well with a busy schedule because each step can be completed in an evening after work and then set to rest in the refrigerator to wait until the next evening. 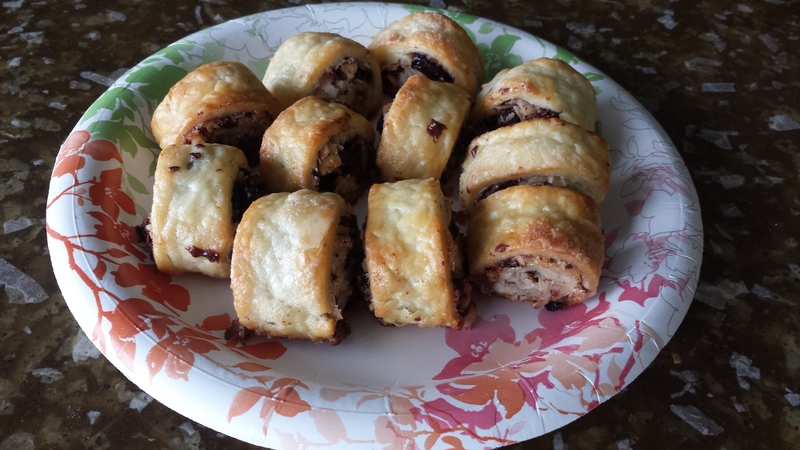 My first attempt at rugelach was with the BWJ group, here’s the link to that post. I took that first batch to work and weeks later someone said that it was so good that they had actually dreamed about it! It was good, but it wasn’t very pretty. I didn’t get that reaction when I took this batch to work, but it disappeared from the staff lounge in short order. I didn’t freeze the rolls before cutting them. I just rolled them and left them in the refrigerator over night. They sliced just fine the next morning. The recipe says to bake them seam side down which leaves the cut sides exposed. I wondered if it would work to stand them up like that, but it worked just fine. The only other change I made to the recipe was to cut them 1 inch thick instead of 1/2 inch thick. Otherwise I followed the recipe as it was written. The filling ingredients need to be finely chopped because the dough is very thin and fragile. My chocolate pieces were too big and some poked through the dough as I was making the rolls. I liked this recipe, but I think I like the filling ingredients I used for BWJ better. I have a second batch of dough chilling right now that I am going to fill as I did for BWJ — apricot levar, pecans, almonds, hazelnuts, dried Calimyrna figs, jumbo raisin medley (Trader Joes brand) and dates. We don’t post the recipes in order to encourage you to purchase the book, Baking Chez Moi by Dorie Greenspan. Get a copy and join in our baking fun. 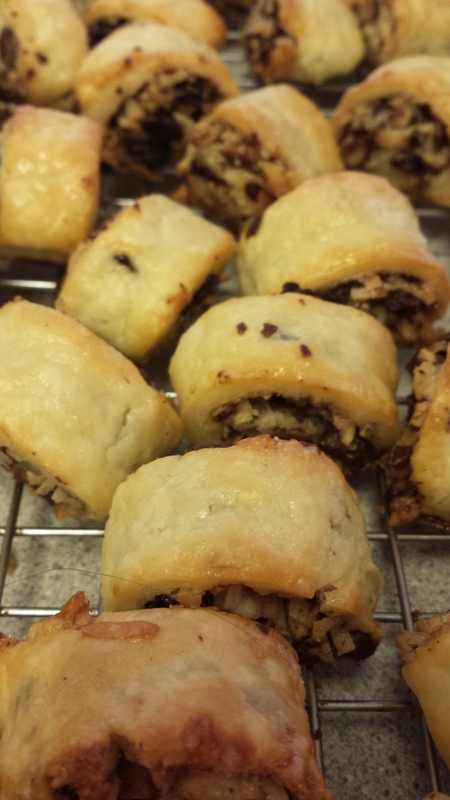 To see what the other bakers did with their rugelach check out the links they left on the Tuesdays with Dorie blog. This is a delightful little tart and really easy to make. 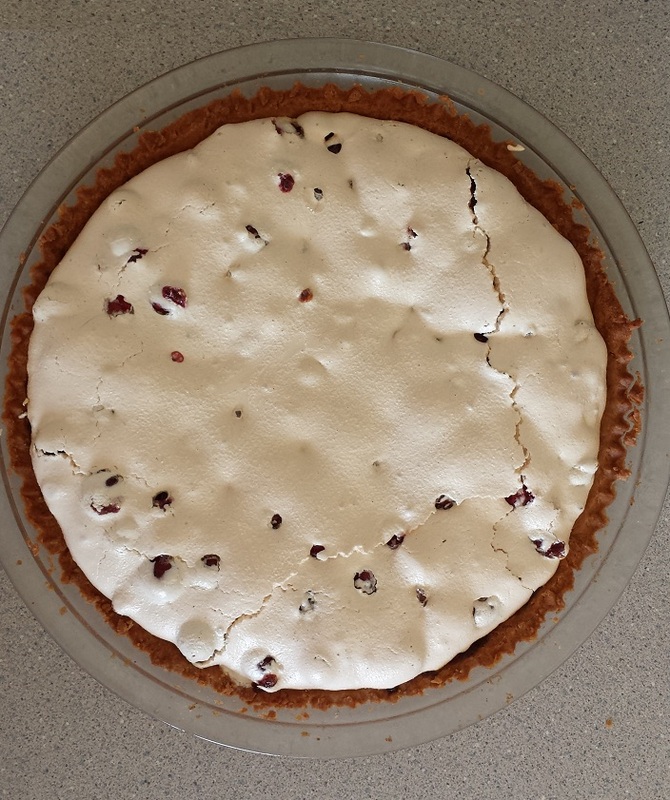 I love the tart cranberries suspended in the crunchy meringue. 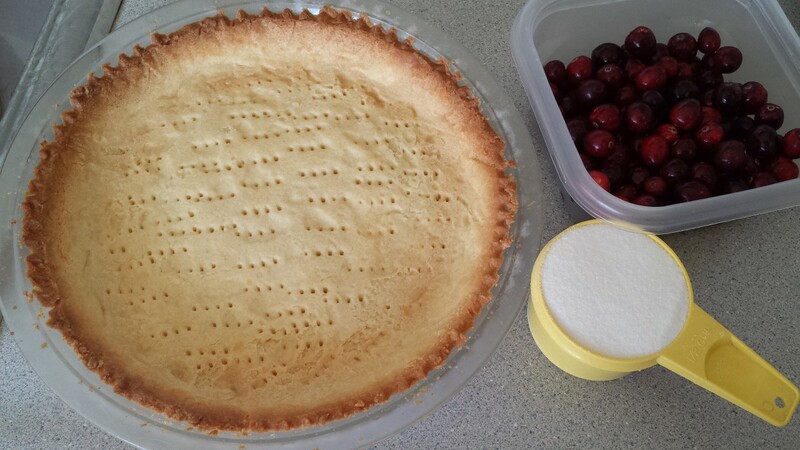 I made it with the sweet tart dough in the pie pan, however it seems like a tart pan would work just as well. Just a couple of tips; 1) cover the edges of the crust as I got them too brown 2) use a hand mixer to beat the egg whites, the Kitchen Aid stand mixer just won’t deal with the small volume. The recipe is on pages 135 – 136 of Baking Chez Moi, by Dorie Greenspan. It was our second assignment in the Tuesdays with Dorie bake along for this fabulous new cookbook. Click on over and see the other bakers versions. We don’t post the recipes online, if you want to bake along with us buy a book and jump in. 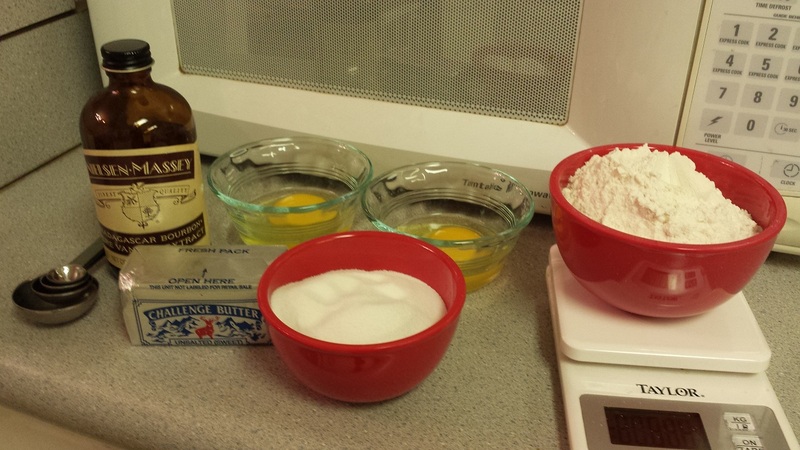 However, this recipe happens to be one that Dorie has on her website, so give it a try. Up next, Rugelach. I am a Baking with Julia dropout. I couldn’t keep up. Now Dorie Greenspan has a new cookbook, Baking Chez Moi! The theme of the book is French home baking and Tuesdays with Dorie is going to start baking their way through the book. I am going to take up the challenge and join in the fun hoping to keep up with the group this time. What better way to kick off my start on this new challenge than to meet Dorie and have her sign my book. In looking over her book tour I realized that I wasn’t going to be able to attend any of her stops in Southern California as I was getting ready to leave for a business trip to Chicago, BUT WAIT, Dorie was going to be in Chicago when I was and only a mile from my hotel! The first recipe for the challenge is Palets de Dames, Lille Style. This recipe is posted on the book’s Amazon page as a sample recipe. Palets de Dames are beautiful little white cookies with a white icing. I mixed the dough in the evening, refrigerated it overnight. Then shaped and baked the cookies in the morning. The instructions for icing the cookies were easy to follow and they turned out beautiful. I do have just a couple of comments about the icing. The recipe calls for “a few drops of lemon juice”. I used too few drops and you really couldn’t even taste the lemon at all. I was too concerned about getting the icing too thin, as I added a bit more milk it was easier to achieve a nice smooth surface on the cookie. These cakey little cookies are perfect with a cup of coffee or tea. 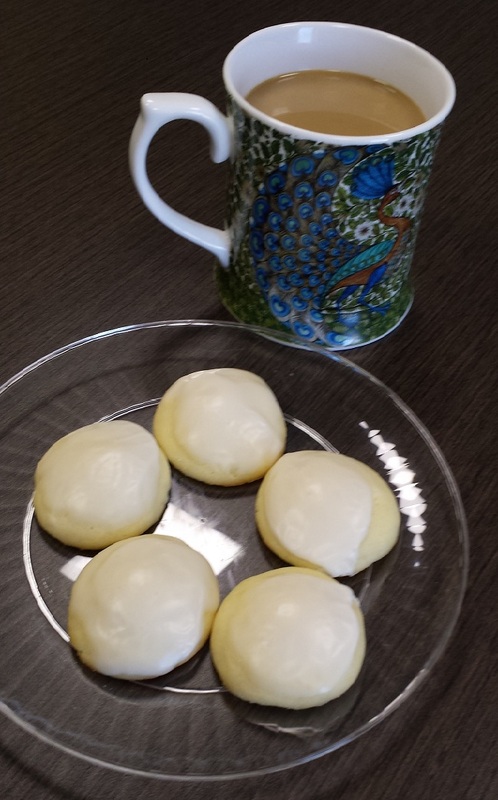 Check out the Tuesdays with Dorie blog to see everyone’s version of these delightful cookies, or better yet buy a book and join us!